Whether the perfect shot is up close or seemingly out of reach, you'll capture it beautifully thanks to the amazing 50x (24-1200mm) zoom power of the Canon PowerShot SX530 HS Wi-Fi Digital Camera. Think high-magnification shooting is tricky? Not with this camera: from its comfortable ergonomic grip to its advanced systems like Intelligent IS and Zoom Framing Assist, the PowerShot SX530 HS is designed to let you track your subject easily, and capture it with accurate focus and clarity. The camera is also equipped with Canon's sophisticated wireless connectivity, so sharing your spectacular images and videos with friends, family and other devices is seamless and simple. The quality of both your still images and breathtaking 1080p Full HD video will impress you, especially in low-light situations, due to a 16.0 Megapixel High-Sensitivity CMOS sensor and the DIGIC 4+ Image Processor, which together create the Canon HS SYSTEM. Whether you're home with family or traveling the world, you'll want the amazing zoom power and advanced performance of the PowerShot SX530 HS camera by your side. The latest advance in Canon Optical Image Stabilization technology, Intelligent IS, analyzes camera movement and applies the best shake correction method for the shooting situation. For stills, the system selects from Normal IS, Panning IS, Macro (Hybrid) IS and Tripod modes. When shooting video, the system selects from Dynamic IS, Powered IS, Macro (Hybrid) IS and Active Tripod IS modes. With Intelligent IS, you can concentrate on image capture, letting the camera make the most effective IS settings to help capture the steadiest possible image. PowerShot digital cameras with built-in NFC (Near Field Communication) technology eliminates the need to manually find and open the new Canon CameraWindow app on your mobile device. Simply touch the NFC icon on your camera to your compatible Android device, and the CameraWindow app will launch automatically for quick, easy sharing of your images. Built-in NFC technology also makes it simpler to install the app. If the app hasn't been installed yet, once you touch the devices together for the first time, the download screen will display automatically. Now, NFC helps ensure making a connection to a compatible Android device truly seamless. Simply touch the camera against an NFC-equipped device with the Canon CameraWindow app installed, and the Wi-Fi connection is established -- no camera operations required. Even if your camera is off, NFC turns the camera on and establishes the connection (confirming the camera's nickname and privacy settings before the first connection is required). Built-in Wi-Fi technology for on-the-go convenience when you want to share your photos and videos with friends, family and the whole world. Easily post your images to social networking and media sites -- Facebook, Twitter, YouTube, Flickr, and Google Drive -- through CANON iMAGE GATEWAY directly from your PowerShot camera, or save them to the online photo album to share anytime, anywhere. The camera can also connect directly to both iOS and Android devices, and upload images via the free Canon CameraWindow app without a computer. You can control the destination of your uploads to share with everyone or to selected groups, and even add comments. Sharing video is also easy with Wi-Fi equipped PowerShot cameras, which record video using the easy-to-share MP4 format. Enhanced Wi-Fi makes posting in real time possible, so you can keep everyone up to date with photos and video even as events unfold. 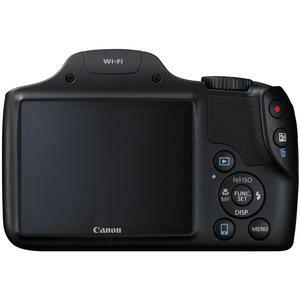 Wi-Fi technology also allows you to transfer images to other Wi-Fi equipped PowerShot cameras or print your photos directly to a PictBridge (Wireless LAN) certified printer. In addition to wirelessly transferring photos and videos through CANON iMAGE GATEWAY to your computer, now you can view and download them from your smartphone. Take them anywhere, anytime, and use your familiar smartphone operations to view and share them. With the built-in Wi-Fi on the PowerShot SX530 HS camera, you can use your smartphone or tablet to remotely control the camera. 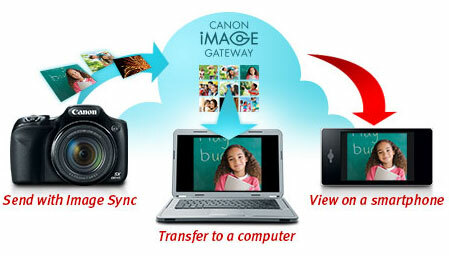 Simply connect wirelessly to your device and access the free Canon CameraWindow app. Your device will show a live image of the camera's capture -- perfect for a commemorative group photo, wildlife shots and all kinds of situations. The camera's versatile 50x Optical Zoom, flash, self-timer and shutter are all under your control, with images being saved to your camera as usual. The camera's dedicated Mobile Device Connect Button gives you one-touch access to your compatible mobile device or computer (utilizing Image Sync function). You can transfer photos and videos to your smartphone or tablet for immediate sharing, to a computer on the same network. When the camera finds a linked computer on the same wireless network, images are sent directly to it. Otherwise, images are temporarily stored on CANON iMAGE GATEWAY then transferred once a connection is made -- very convenient when you're on vacation or out for the day. 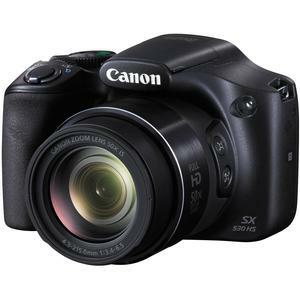 The PowerShot SX530 HS camera is fully compatible with Canon's brand new photo and video storage device: the Canon Connect Station CS100. By simply tapping with NFC, photos and videos are wirelessly transferred to the Connect Station CS100, where up to 1 TB of hard drive space (has the capacity for approximately 150,000 photos or approximately 70 hours of video content) and simple menus make them easy to store, manage and sort by albums, date or device name. From there, images and videos can be viewed in Full HD on an HDTV (via an HDMI cable), sent to compatible wireless printers, viewed/uploaded/downloaded from smartphones and tablets or PCs, and shared with other Connect Stations and on social networking sites. 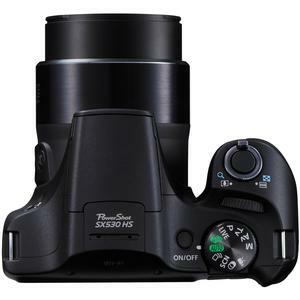 The PowerShot SX530 HS camera employs a 16.0 Megapixel High-Sensitivity CMOS sensor, which delivers state-of-the- art imaging performance and is optimized for use in compact cameras. Utilizing a sophisticated light-capturing design, it provides high sensitivity for improved high ISO capture with reduced noise. It is also a high-speed design, capable of rapidly capturing and moving image data to the processor, enabling faster continuous shooting and faster autofocus. 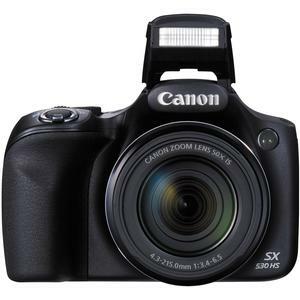 The Canon DIGIC 4+ Image Processor powers the PowerShot SX530 HS camera's advanced functions and capabilities, including Hybrid Auto, Creative Shot, and Full HD video shooting at 30p. Its accelerated processing speed creates fast, responsive performance, for a shooting experience that's easy and natural. The DIGIC 4+ Image Processor also enhances image quality in several ways. Processing of high ISO shots has been shortened by approximately 60% compared to the DIGIC 4 Image Processor. This significantly reduces noise for brilliant color, smooth gradations, and beautiful detail even in low light. The processor also allows for the integration of electronic Dynamic IS. This advanced system compensates for multiple motion types, effectively preventing angular blur, shift blur, and blur caused by parallel movement and tilt. The result is images that are reliably sharp and clear at all lengths of the camera's powerful zoom. The processor's highly efficient design also extends battery life. Canon PowerShot digital cameras give you the power to capture beautifully detailed, naturally lit images even in low light -- reducing the need for flash and the occasionally unwelcome effects it produces. 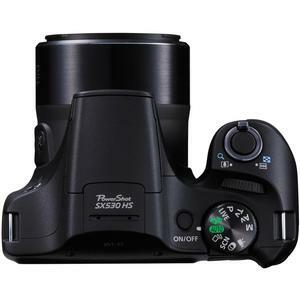 That's because the PowerShot SX530 HS camera's 16.0 Megapixel High-Sensitivity CMOS sensor works with the DIGIC 4+ Image Processor to create the Canon HS SYSTEM, specifically engineered for spectacular low-light performance. With the Canon HS SYSTEM, you'll experience excellent tracking performance even in low light, and achieve gorgeous still image quality at ISO speeds up to ISO 3200; beautiful low-light shots are possible with minimal noise and maximum detail in highlight and shadow areas. The large, 3.0-inch high-resolution LCD screen makes it easy to both frame and review your shots. A resolution of 461,000 dots makes even the smallest details clear, and images are viewable even from a wide angle, so showing others what you've captured is easy, too. With its 50x Optical Zoom lens, the PowerShot SX530 HS camera has the telephoto reach to capture subjects a long distance away. At maximum telephoto, however, it can be challenging to track a moving subject. The Zoom Framing Assist seek function makes it much easier to use the camera's powerful zoom lens. When you press and hold the Zoom Framing Assist button, the camera will automatically zoom out to include a wider angle of view, enabling you to more easily locate your moving subject. Once you find it, releasing the button will cause the lens to return to its original zoom position, intelligently keeping the subject in focus until you're ready to shoot and capture the perfect close-up moment. You can even make zoom adjustments while the button is pressed, with an animated assist frame that makes viewing easy. When the button is released, the lens will return to the adjusted zoom position. And with the Zoom Framing Assist Lock, the camera will lock onto and automatically track a subject, intelligently keeping them in the center of the frame until you're ready to capture the perfect close-up shot. Zoom Framing Assist offers a seek assist function that detects when you're panning (for instance, to search for the location of a soccer ball) and automatically zooms out to help; stop panning, and the zoom returns to its original position. Zoom Framing Assist keeps your subject's face the same size in your frame no matter how they move. Tap the Zoom Framing Assist function button to detect your subject's face. As your subject retreats and advances the camera automatically zooms in and out so their face remains the same size. It's especially useful for capturing the expressions of fast-moving children. The system has been further enhanced by letting you choose the subject's size: choices include face, upper body, whole body, manual or off for superior assistance and control. And, for even more convenience, all Zoom Framing Assist functions are also available when shooting video. The Creative Shot mode featured on the PowerShot SX530 HS camera can help anyone create images with artistic flair. Rather than randomly applying filters, Creative Shot mode takes advantage of advanced Canon technologies to analyze the individual scene, subject and exposure to apply any of 46 filter options. In addition to the original shot, the camera automatically produces and saves five additional variations of the composition. Filter choices are grouped into Retro, Monochrome, Special and Natural categories to make exploring the world of artistic photography fun and easy, or simply select Auto to access the full range of effects. With Creative Shot mode, the result is stunning artistic photos that are perfect for sharing. Hybrid Auto records up to four seconds of video every time you shoot a still image, then automatically joins the clips and pictures into a video that captures the essence of special days: vacations, important occasions, or any time you're shooting many shots in a day. In this mode, Hybrid Auto automatically recognizes the scene and optimizes camera settings to capture the highest possible image quality. The resulting 1080 HD video is properly exposed, crisp and steady, so your "highlight reel" is stunningly beautiful. Smart AUTO is a sophisticated Canon technology that makes getting that great shot as simple as pressing the shutter button. It automatically detects scenes by assessing various factors in both the background and the subject. Detected scenes are analyzed using predefined shooting situations. The camera then makes optimal settings to help ensure the best possible image capture, whether you're shooting stills or video. With Smart AUTO, all you have to do is frame your shot and capture away. Special Scene Modes have fun and creative filters you can add to your photos without having to use a computer. You can make a quirky portrait using a Fisheye Lens Effect or add a beautiful single-tone effect with Monochrome. Toy Camera Effect simulates a vintage look as if capturing the photo using a "toy" or pinhole camera. Make a scene appear like a small-scale model with Miniature Effect, when shooting from a high vantage point. Super Vivid enhances an image for bright, intense colors while Poster Effect alters the contrast of an image for poster-like presentation. 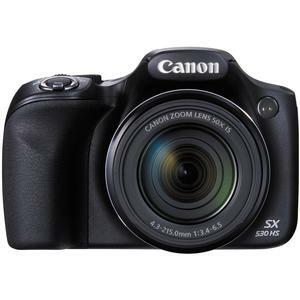 The PowerShot SX530 HS camera is equipped with Canon's latest advancements in autofocus (AF) technology. Canon's advanced AF achieves a significant increase in speed for a shooting experience that's spontaneous and natural. The remarkably responsive High Speed AF lets you capture great shots as they happen, with reduced lag time. Several engineering breakthroughs contributed to this major enhancement to speed. In addition to improved AF algorithms, the camera can process multiple sequences simultaneously, and takes advantage of reworked controls between AF and the start of shooting.